Congress is heading home for the weekend after a final round of negotiations to end the 21-day budget stalemate failed, guaranteeing that the partial government shutdown will become the longest in history. With no headway made over funding President Donald Trump’s border wall, Republican and Democratic leaders have begun to take seriously the president’s threat to declare a national emergency to bypass Congress and secure billions of dollars for a border barrier. No bipartisan talks are scheduled, and the president and Democratic leaders have not budged an inch from their positions in three weeks. Trump’s executive action, which could be announced as early as Friday, would set off a scramble of legal action by House Democrats. Republicans are divided over whether to restrain the president: Some believe it would claw away power from Congress, but others think it will be an elegant way out of the shutdown. “Even if the president’s got authority to do it, I’d advise against it. And I would think that each side ought to be laying something on the table and negotiating,” said Sen. Chuck Grassley (R-Iowa), the most senior GOP senator. People in both parties seem hopeful that the emergency declaration would at least restart the government, even if it’s legally dubious. But some GOP lawmakers openly worry about potential accusations of hypocrisy after Republicans denounced Obama’s previous use of executive actions. GOP Sens. Rob Portman of Ohio and Jerry Moran of Kansas introduced a bill that has $ 25 billion in border security in exchange for temporary protections for Dreamers on Friday, which they hoped could help restart talks but is miles away from anything Democrats would support. 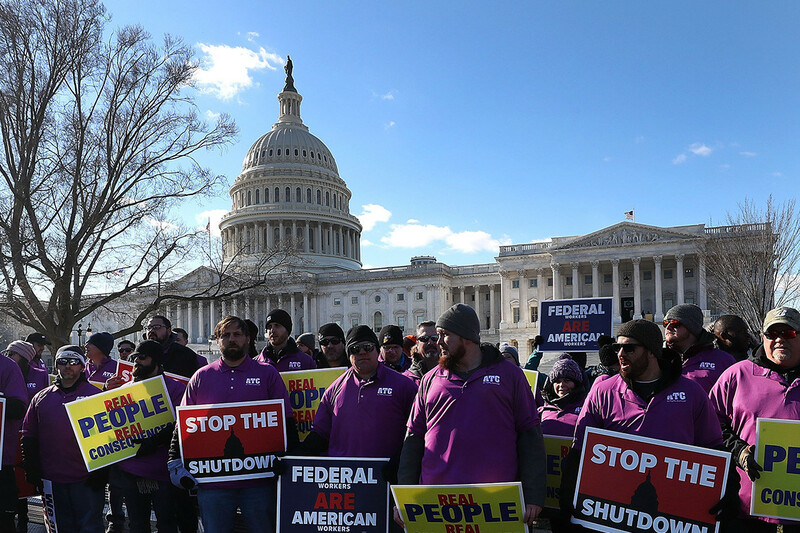 The stakes for the shutdown are ratcheting up, as roughly 800,000 federal workers face their first day without a paycheck Friday, which some frustrated lawmakers hope will create new urgency for both sides to resume dealmaking after an unprecedented four weeks of impasse. Sen. Tim Kaine (D-Va.) was one of the few senators in town on Friday, and he spent the morning telling stories about affected constituents. “It’s really time to end this shutdown. The House wants to end it. An increasing number of senators want to end it by passing bills that are right here in the Senate, available for consideration to reopen government and to engage with the president in a meaningful, short-term, prompt dialogue about border security and immigration reform,” Kaine said to a mostly empty chamber. But it may take more time for the pressure to build. Democratic Reps. Gerry Connolly and Don Beyer of Virginia, both of whom have sizeable federal worker populations in their district, said they’ve been hearing from constituents about the personal fallout from the shutdown. But those federal employees are also very clear, both members said, that they don’t want to be used “as pawns” by the president to build his border wall. “I think people are really reluctant to cave on this for the fear of setting a precedent for years to come with Donald Trump. If he doesn’t like something, he’ll shut the government down,” Beyer said. Before skipping town, the Senate approved a bill Thursday providing backpay for federal workers affected by the shutdown, at the behest of Democrats including Kaine and Brian Schatz (D-Hawaii). The House plans to take up that same bill Friday, according to a Democratic aide, and Senate Majority Leader Mitch McConnell has said the president assured him he’d sign the bill. The promise of backpay would help ease financial uncertainty for scores of furloughed workers in Washington and in farm bureaus, national parks and federal courts across the country. Thousands of contracted workers, such as those who are hired to prepare food, clean, or provide security for federal agencies, have no such guarantee. Approving legislation to eventually repay federal employees could lessen some of the PR backlash that lawmakers are feeling — particularly newly minted House Democrats who say they’re already feeling pressure to answer for the shutdown they inherited. Still, federal workers won’t see a dime of their paychecks until the 21-day shutdown ends. The House will vote Friday on its fourth piecemeal funding bill of the week to reopen slices of the federal government, which have all gradually picked off more GOP defections. The Senate will hold no votes Friday, and there was no sign of any of the top leaders in either party Friday morning in their Capitol suites. On Thursday, 12 Republicans, including former NRCC chairman Steve Stivers of Ohio, backed a bill to fund the TSA. The previous day, just eight Republicans abandoned their party’s position to vote for a funding bill to reopen the IRS and the Department of Treasury. House GOP leaders insist they’re unconcerned about the handful of members who have crossed the aisle, with the vast majority of the GOP conference staying in line with Trump. This week’s vote counts are still far short of overturning a presidential veto. All of the House bills so far have been taken directly from the Senate’s own spending panel’s docket. But more Republicans privately admit they would be willing to vote for different funding bills next week — such as the ones that the House and Senate have jointly negotiated —if Speaker Nancy Pelosi puts them on the floor next week, signaling that pressure is mounting. Yet McConnell has said they won’t go anywhere unless the president endorses them. And Trump killed his party’s own attempt to reopen the government and then kickstart negotiations on the wall and immigration reform. The Trump administration declared this week that it would find a way to make sure that tax refunds are distributed on time, despite a skeleton crew at the IRS. Officials also promised that food stamps for needy families would not be affected, though the Department of Agriculture remains unfunded. Both are steps that the White House has not taken during previous shutdowns, which Democrats describe as a legally dubious tactic. After a series of long-shot funding talks collapsed Thursday, the threat of Trump’s emergency declaration began to sink in on Capitol Hill. Several of the committees with potential jurisdiction over the issue have already been looking into the legality of such a move and Democrats are weighing a potential lawsuit to stop Trump if he does go that route. There was speculation that the Trump administration would use congressionally-approved federal money for water resource development projects to fund the wall rather than military construction funding. The money would come out of unspent money in a disaster spending bill from the Army Corps of Engineers budget, according to news reports. That proposal, however, was met with some resistance from Trump ally and Florida Gov. Ron DeSantis, who wanted those funds to be kept for Florida’s hurricane recovery relief effort. “We have people counting on that, if they back fill it immediately after the government opens that’s fine, but I don’t want that to be where that money is not available to us,” DeSantis said. Matt Dixon contributed reporting to this story.